Great question, and exactly the right question to get started on the search for records of this magisterial ancestor. First things first: what’s a magistrate? The following Treatise is intended as a practice guide for Justices of the Peace, in the discharge of the responsible, and often perplexing duties which pertain to their office. So what sorts of things would a justice like Manuel Lamon have done in the 1850s? Well, looking just at the constitutional language, the first thing Lamon would have had to do is get elected. So election records — nominating petitions, election results, newspaper articles about elections — would be the first place to look. He’d have been required to take an oath of office, which should have been filed shortly after he took office. And he’d also have had to post an official bond “for the faithful discharge of his duties.” And an official commission may have issued. 12 Any or all of these may be available in the office of the clerk of the Circuit Court for Harrison County. As a judge, Lamon would have had authority to sit on civil cases where the maximum damages to be awarded were less than $100 (contract cases) or $50 (tort cases).13 So you want to head to the court records and look for cases that Lamon presided over. There may be court minute books, docket books, records of the cases being appealed to a higher court, orders issued and more. And he’d have had criminal authority to try petty criminal offenses, and to hear complaints, issue warrants, and commit, or bind over, offenders for trial.14 There again, you’re looking for court records — the minutes and dockets and orders. 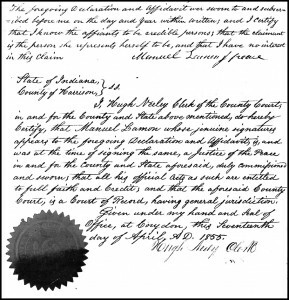 Justices of the peace were allowed to solemnize marriages under Indiana law.15 You’d definitely want to check the marriage records and licenses in Harrison County to see if Lamon did. How ’bout that, Patrick? Manuel’s signature — and the clerk’s agreement that it was genuine — good enough to start with? Good luck, and let us know what you find!! Judy thank you so much for answering my question, and for the find of Manuel’s signature on the Revolutionary War pension. Very cool. This gives some great suggestions for future research. I really appreciate it. It’s a great question, Patrick. Love to hear from you down the road as to what you came up with! Judy, you are so far ahead of the rest of us in genealogy research, you constantly amaze me. I appreciate the vote of confidence, Gus, but there are many people who can (and do) take me to school every day. That’s what genealogy is all about, really — learning something new every day!